Once again, these ants are found in firewood. At first glance the workers look somewhat like Camponotus pennsylvanicus carpenter ant workers. This worker is in the 6.5-7 mm range. The surprise comes when an alate comes crawling out of a tunnel. At this scale you probably still can’t see the difference. 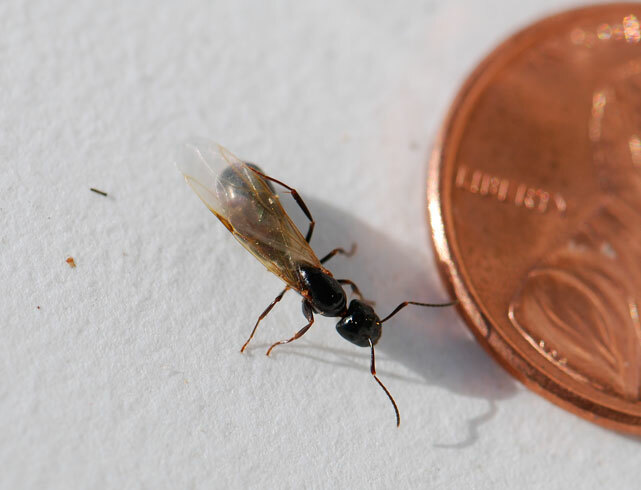 That alate is much smaller than an alate of of a Camponotus pennsylvanicus. Looking closely at a front on view of a worker’s head, you find that they lack hairs on the genae and have few on the clypeus. 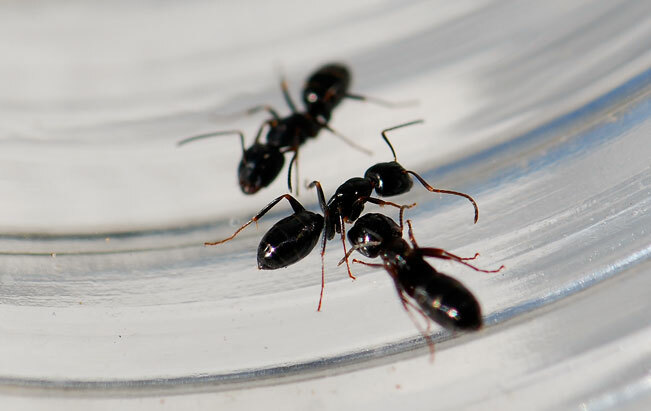 These are Camponotus nearcticus workers. I was a bit surprised, because in the area I was collecting I had typically encountered C. nearcticus with a brown-red mesosoma, like this one at BugGuide. Just goes to show, once again, that color is not a useful guide to identification in ants. According to Hansen, this species is spread throughout the eastern United States and across the northern U.S and southern Canada all the way to the West Coast. They are even found in certain parts of Arizona, although not in the low desert. 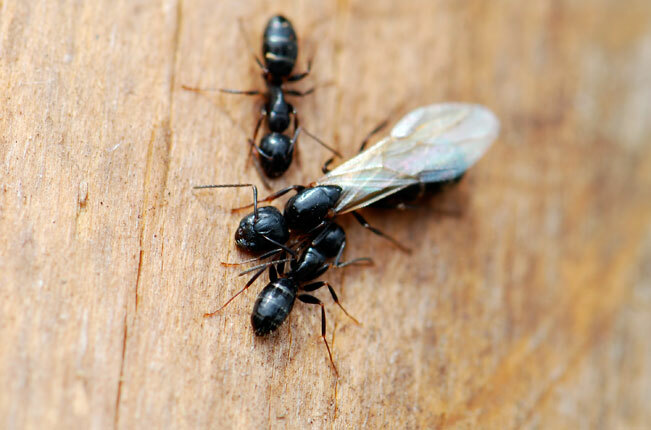 The alates are apparently reared in the fall and overwinter in the nest, as with other carpenter ants. I did not find any larvae or other immatures. Their biology seems to be similar to that of other carpenter ants, but they have not been studied extensively. 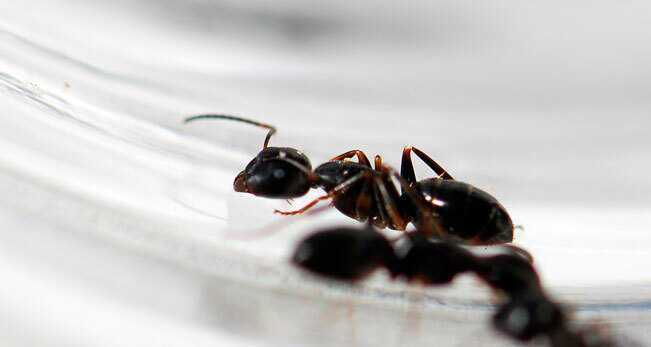 Have you ever encountered Camponotus nearcticus? Continuing on a quest to learn to identify the Pogonomyrmex, I found a nest of the desert harvester ant, Pogonomyrmex desertorum. Character number 1: They are a bit smaller than most harvesters, workers roughly 6mm in length. According to Cole, the P. desertorum in the western regions have more ridges (rugae) on the head and pronotal area (mesosoma) than those farther east, but in general they have fine rugae and are quite shiny or have a “silky luster.” I would say they are pretty difficult to distinguish from Pogonomyrmex barbatus, although they do have finer rugae. These had a simple nest opening, with none of the scattering of pebbles you see with many harvesters. The workers were forging singly, apparently large on plant material. 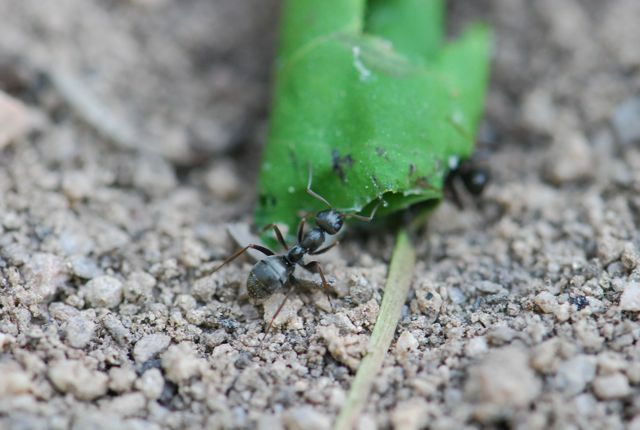 According to Pogonomyrmex guru Pogolumina, Pogonomyrmex desertorum colonies are usually quite small, around 500 workers. One claim to fame for desert harvester ants is that they are prey for horned lizards. As horned lizard numbers are on the decline, that might make these little guys pretty important. 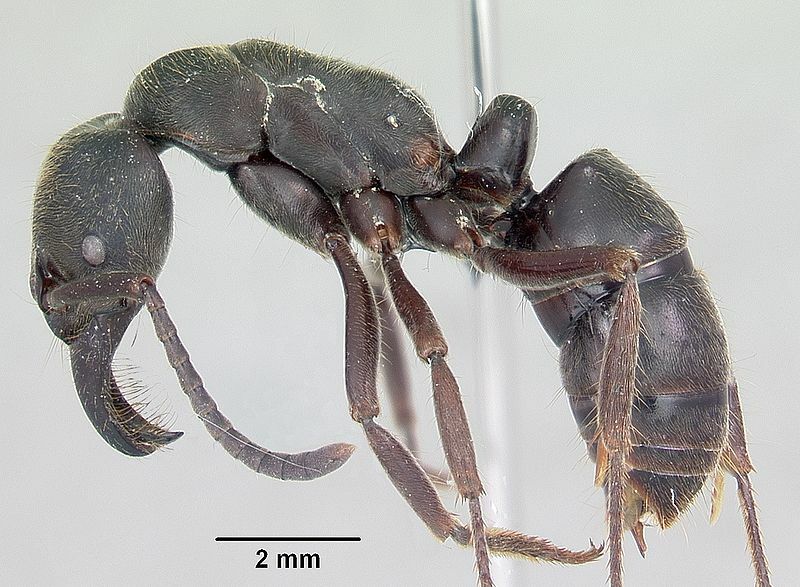 If you happen across a worker ant of Pachycondyla tarsata (previously known as Paltothyreus tarsatus), you will have no need to look them up in a book to identify them. 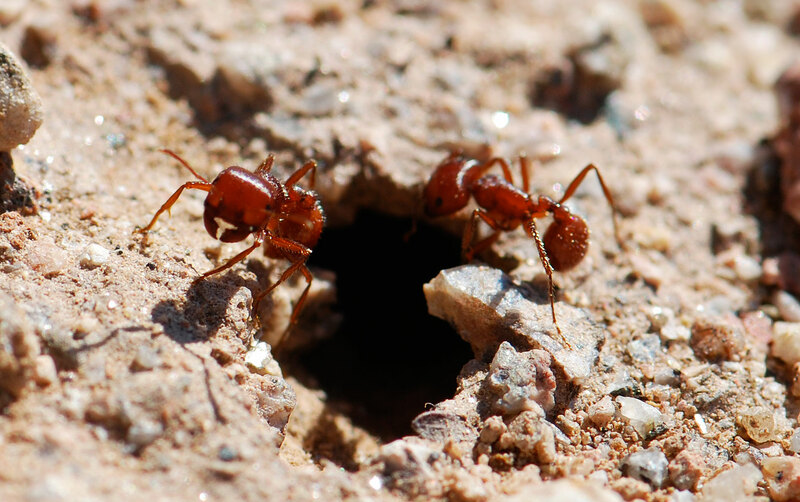 You will probably be able to tell what kind of ant they are by their foul odor. The smell they produce is so bad that they are called African stink ants. Found in central and southern Africa, these large dark gray/black ants are up to 3/4 inch (19 mm) in length. 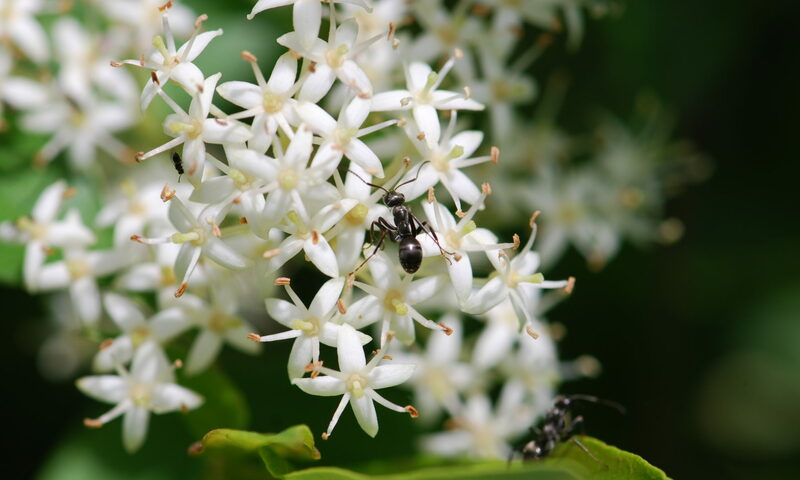 African stink ants produce their foul smell in their mandibular glands. They release the odor only when they are alarmed. Some of their trail and alarm pheromones have been identified. Pachycondyla tarsata are known to prey on termites and also scavenge other arthropods. 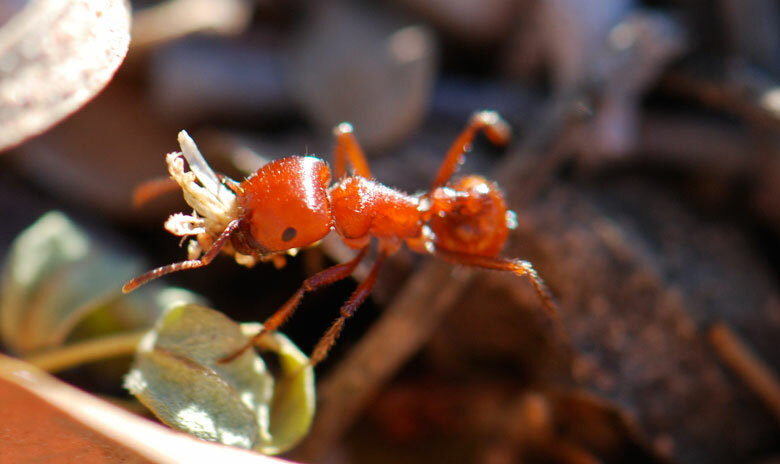 Bert Hölldobler showed that these large ants see well enough to memorize the images of the forest canopy above them when they move about foraging and thus can remember the way back to the nest. 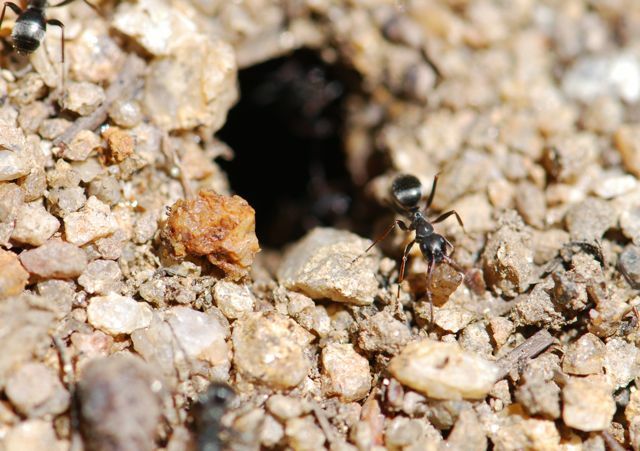 In the following video, you can see the African stink ants raiding a termite nest. The video also contains scenes of lions attacking a water buffalo. If you would like to avoid that, let the video load and then view the segment between 7:00 minutes and 9:00 minutes (the bar pops up in the bottom of the screen if you run your mouse over it). These ants are definitely on my life wish list (behind Harpegnathos saltator). 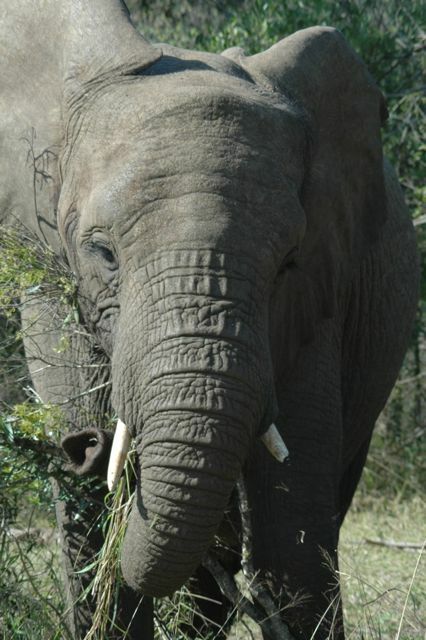 My husband went to Africa a few years ago, but all he brought back were pictures of these (grin). Hölldobler, B. 1980. Canopy orientation: a new kind of orientation in ants. Science. 210: 86-88. 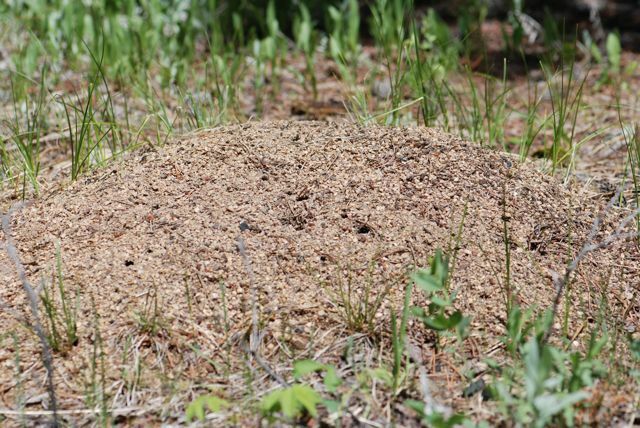 One of the first things you notice about the Formica fusca group ants are their mounds. (These photographs were taken in the Colorado Rockies). Bare mounds of soil and small pebbles stand out amongst the vegetation. As you get closer, you can see that the mound does have some brown bits of vegetation scattered about, such as dried conifer needles. 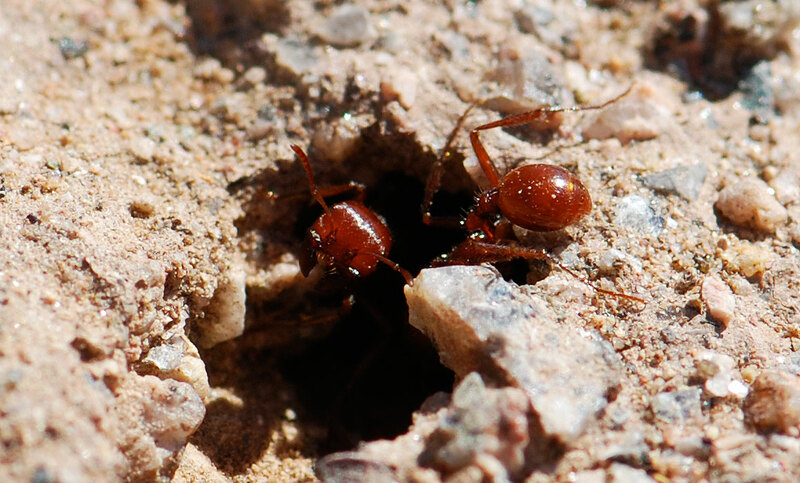 There are also multiple entrance holes, something you don’t see as much in the mound-building harvester ants. Closer still and you can see the black ants with their large eyes. 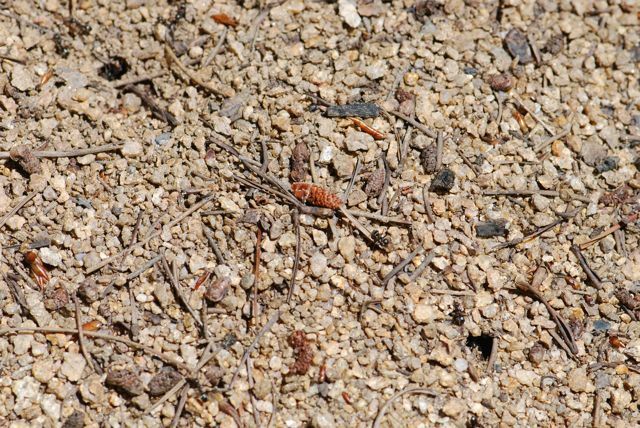 These ants are called the “Formica fusca group” because there are a number of ant species that can be hard to distinguish from one another. (See the resources at the bottom for more information.) My best guess about these are that they are part of the Formica subsericea complex, possibly Formica podzolica,, although they look a bit small. 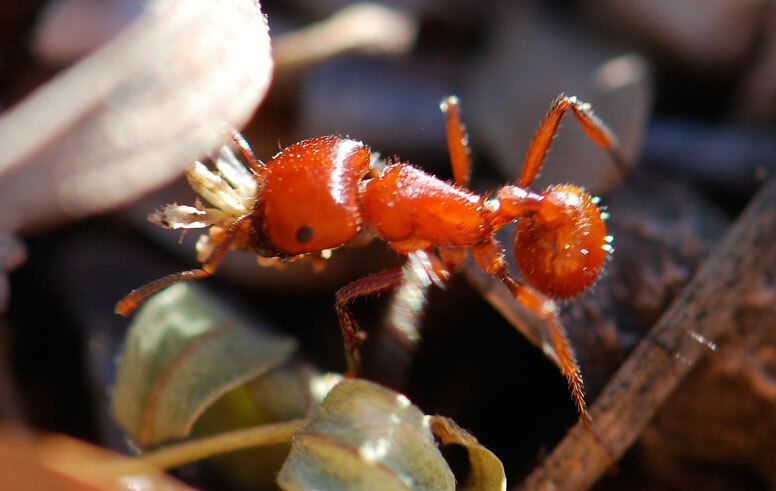 Formica fusca ants get their common name “wood ants” because they live in forested areas or woods, not necessarily because they live in wood. 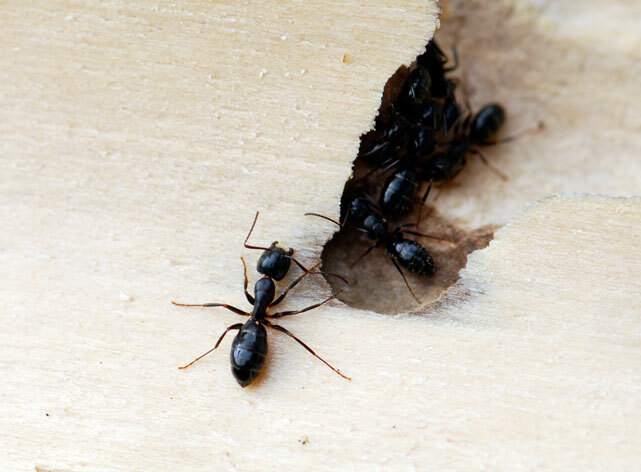 Wood ants, or thatching ants as they are sometimes also called, are easily confused with carpenter ants. 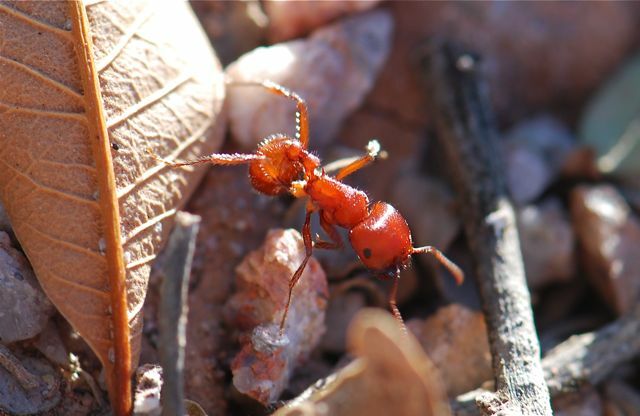 Typically the Formica ants are smaller than Camponotus, and the back of their alitrunk (midsection) has a valley or depressed area, rather than evenly rounded like the carpenter ants. Many species build their mounds in the cooler forests of North America, Europe and Asia. 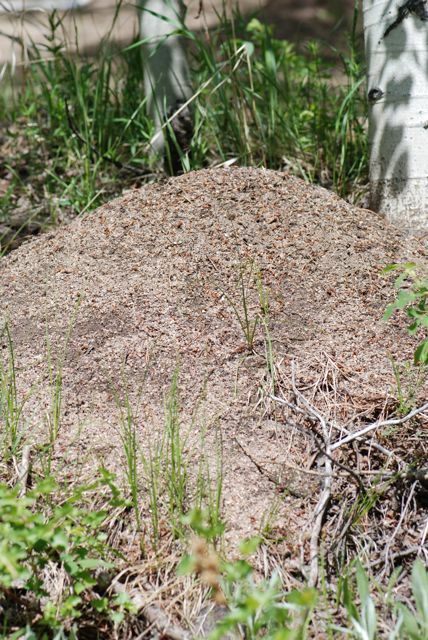 Some of the wood ants cover their mounds with pine needles and bits of twigs, so they look like they have thatched roofs, even more than we saw in the photograph above. The piled up homes catch the sunlight and create a warm interior that allows these ants to live in colder places than most types of ants. 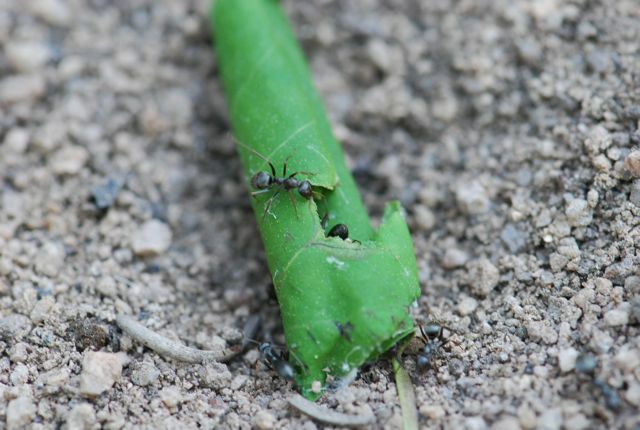 Wood ants feed on aphid honeydew as well as scavenge dead arthropods. They are also predators of common forest pests and are considered to be beneficial to the forest. Wood ants lack a stinger. They defend themselves by spraying droplets of formic acid when disturbed, which causes most enemies to retreat. They also can bite. At a nearby mound I noticed an interesting behavior that may have been related to defense. The workers were wrestling with a green aspen leaf that had fallen on the mound. As you can see, the workers are chewing on and biting off pieces of the leaf. In this video, you can see the same behavior. At the same time, the ants are apparently leaving the brown twigs alone. Do you think it is sanitation? If they wanted to get rid of the leaf, wouldn’t they simply cart it to the side and dump it? Do you think they using the bits of leaves for something? Or perhaps the moister leaves are more likely to mold and cause sanitation issues than the drier twigs and needles. In any case, ants of the Formica fusca group are fascinating ants.